Very often, though, dissatisfied customers don’t give voice to the complaints. Actually, a study by TARP Research as far back as 1999 uncovered the fact that for every 26 unhappy customers, only 1 will bother to make a formal complaint. The rest will either stay where they are disappointed or will silently take their business elsewhere. According to another research by 1st Financial Training services, 96% of unhappy customers don’t complain, 91% of those will simply leave and never come back. A far more dangerous scenario is, however, when unhappy customers start spreading negative word-of-mouth instead of complaining directly to a company. White House Office of Consumer Affairs found that a dissatisfied customer will tell between 9-15 people about their experience. Around 13% tell more than 20 people, which leads to damage of reputation, loss of potential customers and revenue. When gathering customer feedback, whether it’s a questionnaire or simply a follow-up call, make sure to choose the right questions that will provide you with valuable information. Skip the never-ending surveys and stick with a few simple yet most important questions, otherwise you risk not receiving any response at all. Most of unhappy customers won’t bother to complain if it’s too difficult and requires much effort from them. Ask yourself: How simple is the complaint process for your customers? How many steps does it take to complain? 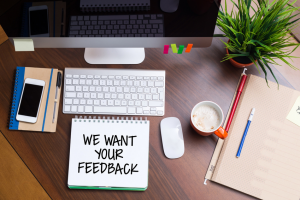 If you want your customers to speak up and tell you what’s wrong, make it convenient and as easy as possible for them to provide their feedback. Eliminate any unnecessary processes or actions that would discourage customers from making the effort to complain. When a customer wants to share negative feedback, and they run into hurdles and barriers trying to voice their complaint to someone, all they do is get even more angry. The result is a small problem develops into a bigger one, simply because a customer cannot find a quick and easy way to channel their anger, frustrations and concerns to your business. According to the Rockefeller Corporation study 68% of customers leave a company because they believe you don’t care about them. This is also one of the major reasons why many unhappy customers never complain. They think it’s a waste of time to provide feedback because the company is simply not interested in hearing from their customers. Some might have developed this sort of apathy from their previous experience, when they have complained in the past but nothing was done about it. If customers don’t see the point in complaining and believe that they are not going to get a satisfactory resolution anyway, why would they share their frustration with you? To change that, let your customers know that you truly value their feedback and that you will do your best to address their complaints and resolve their issues. Some angry customers choose to stay silent due to their personality type. Instead of speaking up and voicing their complaints to the business that disappointed them, these type of customers usually don’t see any need or desire to express themselves. It simply might be the most painless and least bothering option for them. Sadly though, those customers will probably end up with a competitor sooner or later, if the issue is not addressed proactively. One of the reasons dissatisfied customers will not complain is because they are worried of what might come next. Will they be penalized in some way or get even worse service next time? Will it have a negative impact on an otherwise good relationship with a business? Will a wrong employee be punished or even get fired because of their complaint? In order to avoid the possible outcomes keeping mute about the problem they encountered becomes much more convenient for them. Reassure your clients that voicing out their complaints won’t have any kind of negative consequences. Complaints are gold for any business. Are you encouraging your customers to share their concerns and frustrations with you? Making sure that you are easily accessible and welcoming to all types of feedback will help you improve through insight you may not otherwise be capturing. Always remember to thank your customers for complaining rather than lashing out or making excuses. After all, they’ve just helped you make your business better. And finally, take action to prove to your customers that their effort was worth their time. This entry was posted in Articles and tagged 5 must-have's of customer experience, angry customers, complaining customers, customer complaints, customer feedback. Bookmark the permalink. I give my clients great value, I always ask for their help to improve my service and I always ask for feedback. I believe that’s how we build customer loyalty. Getting feedback and learning how to take criticism is essential to any business so it can adjust and learn how to give customers a better experience. You’re right, complaints are gold if you learn from it. Thanks for the great write up! Glad you enjoyed it, Henry! The biggest issue is the length of time on the phone it takes to make a complaint. Companies should make reviews on how long it takes to make a complaint. If they truly value a customers feedback to improve their services, shouldn’t they make the process fast and simple? For example, my hourly rate is £70 an hour. I needed to make a complaint to an Internet server provider for speed issues. I was on the phone for almost 30 minutes and received a £10 credit to my account…was it worth complaining about? No, I will just switch Internet service providers if it happens again and the company has no idea why I left their services. Totally agree, there always should be a quick and easy way for customers to complain, whether it’s on the phone or any other service channel.